The United States Palestinian Community Network (USPCN) and Rasmea’s supporters and legal team have called for the 13th of this month to be NATIONAL DAYS of ACTION to support Rasmea and demand dropping of the charges now! If convicted, Rasmea faces up to 10 years in prison, being stripped of her U.S. citizenship, and probable deportation. We cannot allow this to happen. The charges against her are a political attack on her as an individual and on Palestinian, Arab and Muslim communities across the U.S. as a whole. The U.S. government is attacking Rasmea just as they attacked the Holy Land Foundation, the 23 anti-war and international solidarity activists in 2010, Chicano leader, Carlos Montes, and many others who have fought for justice and dignity. Call and send photos of support for Rasmea! 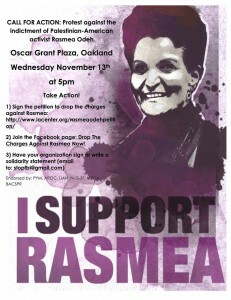 Join the Facebook page: Drop The Charges Against Rasmea Now!